You can’t get my son to eat his broccoli and spinach if you don’t promise a pasta dish to show up on the table in the near future. He loves spaghetti and meatballs and it’s a nice variation to his top favorite dishes: pasta with creamy sauce or pasta with minced meat. You can’t go wrong with this dish. I used a different recipe for the meatballs than in the spaghetti and meatballs recipe that I posted before. The basic difference besides the ingredients is that here I first I cooked the meatballs in the oven and then added them in the tomato sauce (based on R. Ray’s foodnetwork recipe). I liked this version better. How to make: To make the pasta, boil the pasta with some salt according to package instructions. To make the meatballs, mix all the ingredients, form meatballs with your hands and cook in pre-heated 425 F/220C for about 10 minutes or until no longer pink. To make the sauce, heat the olive oil in a big saucepan and saute the onion for a few minutes. Add the garlic and red pepper and cook for couple more minutes. Add the beef stock, crushed tomatoes, parsley, basil, salt & pepper and cook the sauce at low heat for about 15 minutes (start counting after it starts boiling). Stir in some sauce in the pasta. Add the meatballs to the remaining sauce. Serve the pasta and top it with meatballs. Have some ground Parmesan and a spoon available at the table. Gusto perfetto! Notes and tips: When I drain the pasta and put it back in the pot, I always drizzle a teaspoon or so of olive oil, even if I’m planning to serve it with a sauce. That way I can save the pasta in the fridge, reheat, and serve it at a later time. 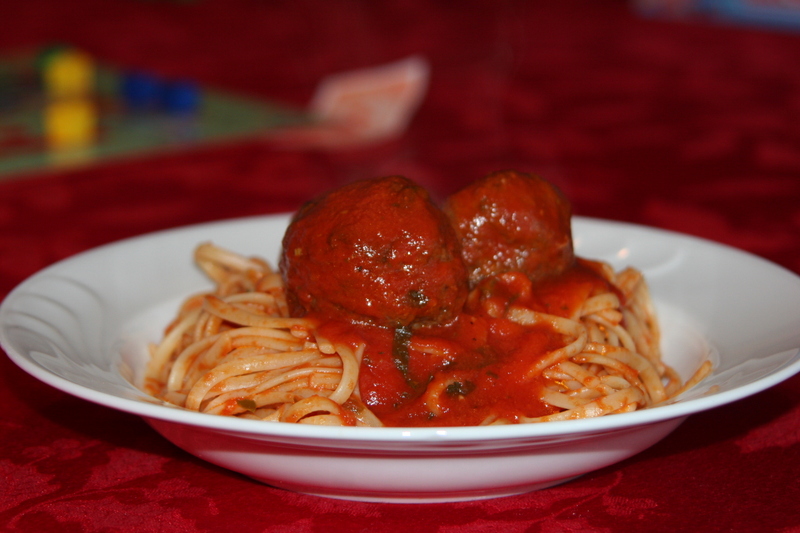 I loved the spaghetti and meatballs! They were yummy! Thank you, Melina! I couldn’t have any more dedicated fans of my cooking and I’m so glad about that.